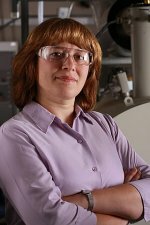 Congratulations to Dr. Julia Laskin at Pacific Northwest National Laboratory, who was honored with a special issue of the Journal of the American Society of Mass Spectrometry in June 2009, now available online. The issue, containing invited articles by several experts, recognizes Dr. Laskin's 2008 Biemann Medal for her early career work in mass spectrometry. In the scientific community, Dr. Laskin is internationally known for her work on gas-phase ion chemistry and mass spectrometry of large, complex molecules. With her colleagues from around the world, she is designing techniques to better characterize complex molecules in biological samples, atmospheric aerosols, and biofuels, work critical for a secure energy future. Dr. Laskin conducts her research at the Department of Energy's Environmental Molecular Sciences Laboratory, a scientific user facility at PNNL. In addition to her research, Dr. Laskin mentors postdoctoral fellows, visiting scientists, and undergraduate students. Among the awards she has received for her work with others is the 2007 Outstanding Mentor Award from DOE's Office of Science. The special issue of the journal will be distributed at the annual American Society of Mass Spectrometry meeting in Philadelphia in June.